Can you tell us a bit about your role please? I cover pretty much everything! Overall management of the company, responsible for bringing in business and delivery of the various experiences we offer and services to motor manufacturers. That includes selling and taking bookings on the phone if in the office (it is important for me to talk to our customers on a regular basis), running events and still getting out on track and instructing as well. I am also involved with promoting Thruxton’s race meetings. How does a typical day (if there is such a thing!) pan out at Thruxton? What sort of jobs would you do? I am either in the office or out on events, and those are probably split almost equally between the various ones that happen at Thruxton and the different manufacturers we work for such as BMW, MINI, Vauxhall, Ferrari and Maserati, who could be running an event anywhere. Had you always had an interest in motor sport and did you want to work at one of the world’s most famous circuits? Yes I did, from a small boy. I am really interested in cars and racing and keep up to date with both by reading most of the weekly/monthly motoring magazines. I actually went to art school and after leaving, I persuaded my dad to buy me a racing car which was how it started. I started working at Thruxton in 1983 on a self-employed basis and it turned into a full time job in 1992 when I became manager. Do you ever meet the rich and famous? Yes, I have met some famous people over the years and probably cannot remember them all. Recent customers have been Michael Fassbender, Michelle Rodriguez (Fast & Furious) and David Jason (Del Boy). All very nice people who share an interest in cars and driving. What are the a) most silliest and b) most amazing things you have ever experienced or seen at the venue? There are always things that make you laugh, almost every day. Amazing things – well lots of amazing/rare/very expensive cars (road and racing) and the day that three Harrier jets came in to ‘beat up’ the airfield springs to mind. We had a group from RNAS Yeovilton doing some activities so low and fast that they had to climb to miss the pit garages. I should point out (as with many race circuits in this country) that Thruxton was originally a World War II aerodrome and is still a busy airfield for fixed wing aircraft and helicopters. Red Letter Days has been selling gift experiences for 25 years. If you could choose any Red Letter Day, what would it be and why? Any of the flying experiences – see below. In another life is there a different job you would have liked to have focused on? An RAF pilot (I wear contact lenses so would not have been able to get in) but through my job I have managed to hitch a ride on six occasions in the back seat of a two seat Harrier Jump Jet and BAE Hawk (as flown by the Red Arrows) and was given the chance to do quite a bit of flying, so I have fulfilled an ambition – still the most exciting thing I have ever done! Is it hard to switch off from the track? How do you like to relax? It is difficult to stop thinking about the next project and to be honest you always tend to be thinking about an element of work all the time. Running, walking, cycling – those type of activities are relaxing. Wow, it’s been amazing to get such a privileged insider’s view of someone at the hub of one of our greatest circuits. Thanks Andrew! So if you are an adrenaline junkie who enjoys living life in the fast lane, check out one of the world’s most famous race circuits and the incredible experiences it has to offer. Follow in the tracks of F1 (and movie!) 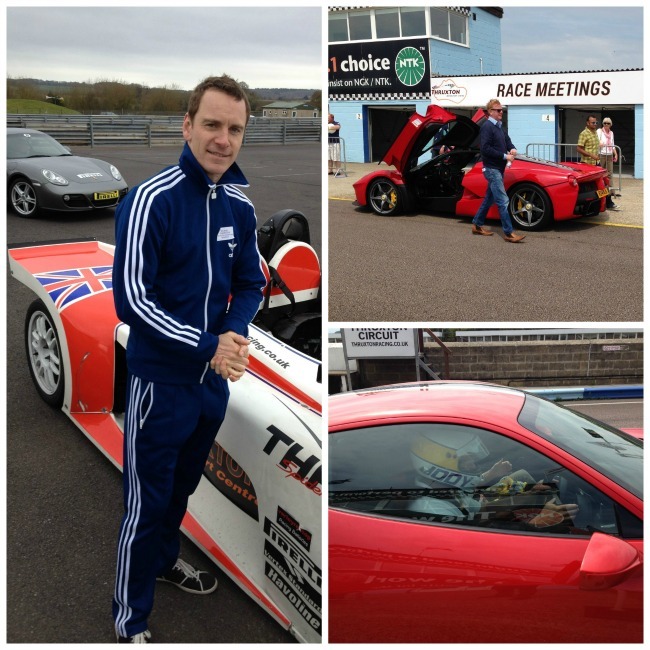 legends with a Red Letter Days driving experience at Thruxton.